Rackspace CDN offers the following certificate types for secure delivery: Rackspace shared domain, Subject Alternative Name (SAN), and Custom. These types are distinguished by how much ownership a customer has over the secure certificate. No matter what your secure certificate type, the following requirements apply to all customers delivering HTTPS traffic with the Rackspace CDN product. To serve encrypted traffic from the Akamai edge network to an origin over HTTPS, the origin (that is, the web server or load balancer) must have a secure certificate that was provisioned by an approved Certificate Authority (CA). Site operators must also ensure that the configured origin certificate(s) have a valid trust chain leading to a trusted root certificate. This includes configuring the proper intermediate(s) to be served by the server (where required). Note: Server Name Indication (SNI) configurations on origin servers are supported. Certificates issued by Let’s Encrypt are approved for use with Rackspace CDN. IdenTrust has cross signed Let’s Encrypt intermediates with their DST Root CA X3. This includes Let’s Encrypt Authority X3 which is the primary intermediate used to issue Let’s Encrypt certificates. All Rackspace CDN certificates are provisioned by using organizational validation (OV). This method of validation requires that the domain administrator is contacted to validate the ownership of the domain. This validation has already been addressed for customers using Rackspace shared domain, but a certificate authority contacts all customers that purchase a SAN or Custom certificate to validate their domain ownership. For this reason, it is critical that your domain’s WHOIS information is up-to-date. You can check your current WHOIS information at http://whois.icann.org/. If this information is out-of-date, update it with your DNS provider before submitting a request for a SAN or Custom certificate. This method of secure delivery uses a shared Rackspace domain and implements a wildcard certificate that Rackspace owns and manages. When you use a shared domain, your SSL domain is structured as https://mysite.secure.raxcdn.com/, where mysite is an attribute that you can choose. Because this URL uses the raxcdn.com domain, users of shared domain HTTPS often decide not to use Rackspace CDN to accelerate their entire website. Instead, they are more likely to use Rackspace CDN to accelerate their static content like images, videos, and style sheets. In this scenario, the HTTPS URL is not seen in the browser navigation, but is instead visible only in references in the website code itself. 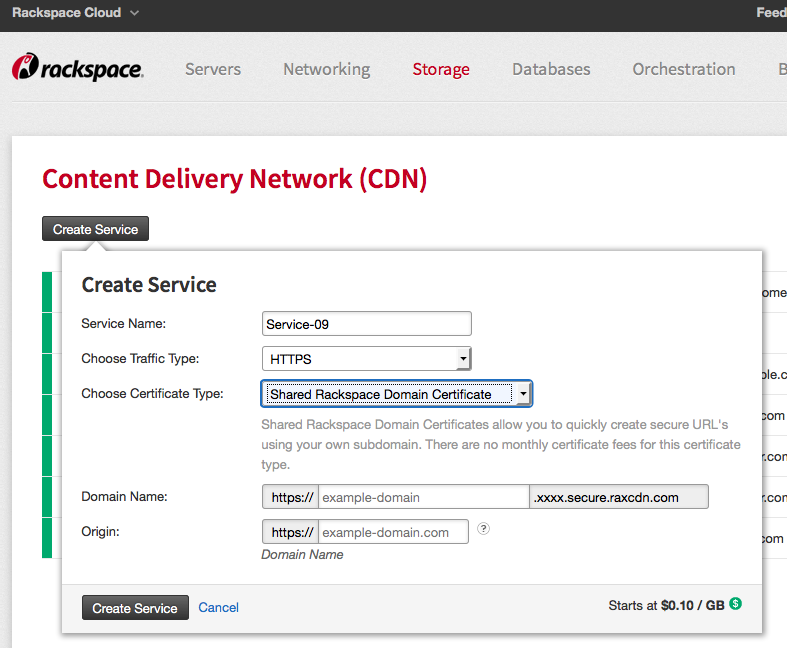 To use the Rackspace shared domain certificate, create a CDN service in the Cloud Control Panel, select HTTPS in Choose Traffic Type, and select Shared Rackspace Domain Certificate in Choose Certificate Type. For more information, see Create a Rackspace CDN service. In the Domain Name field, enter the domain that you want to use in the shared domain URL. This name must be unique across all Rackspace CDN URLs, so we recommend using a name specific to your company or application. Your subdomain (the part of the URL before .xxxx.secure.raxcdn.com in the Domain Name entry) can be only a single word. It can contain hyphens, but it cannot contain periods. Using a Rackspace shared domain for secure traffic does not carry an additional monthly fee. 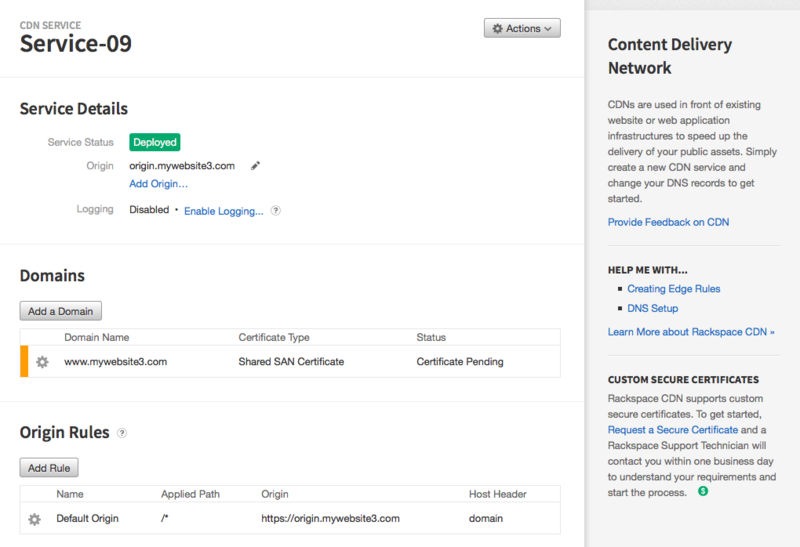 Customers who use this certificate type for secure delivery are charged the standard fee for CDN bandwidth plus the HTTPS request fee ($0.010 per 10,000 requests). Customers who choose the SAN certificate type can use their own domain name when serving traffic over HTTPS. 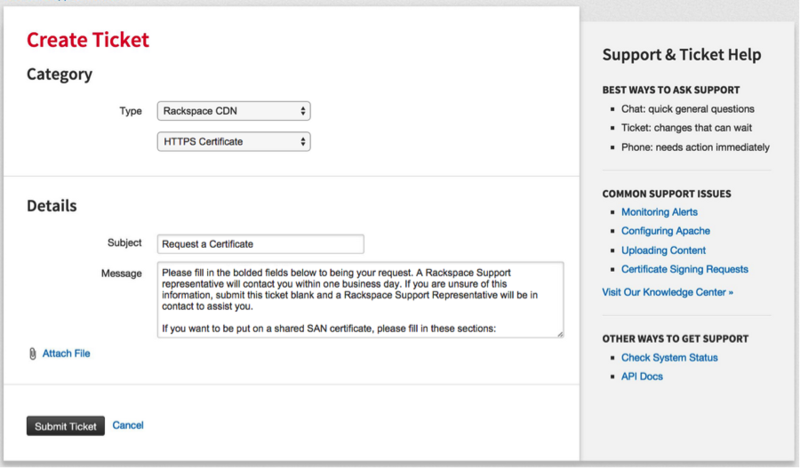 In this method, a customer’s domain name is added as an alternative name on a SAN certificate that Rackspace owns and manages. By offering customers the ability to share a host certificate with other customers, Rackspace can reduce the cost of using your own domain with HTTPS delivery. In this method, a customer’s SSL domain is structured as https://www.mysite.com. 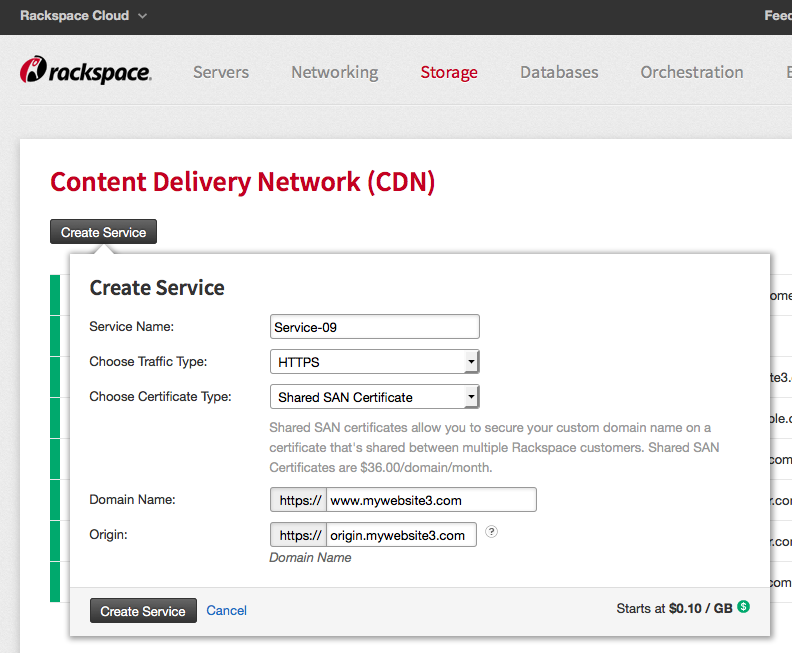 To request that Rackspace add you to a shared SAN certificate, you log in to the control panel and create a CDN service with HTTPS selected under Choose Traffic Type and Shared SAN Certificate selected under Choose Certificate Type. Make sure that you enter a Domain Name with a subdomain and also enter an Origin. Then click Create Service. For more information, see Create a Rackspace CDN service. When you click Create Service, the process is started to create the SAN certificate. You can follow the process on the CDN Service page in the Domains section. In the following example, you see that the Status is Certificate Pending. The CA contacts the administrator of the domain to confirm that Rackspace has the right to add the domain to a shared SAN certificate. The CA uses the domain’s WHOIS information to determine who to contact. For more information about WHOIS information, see the previous section on Organizational validation. Note: It might take up to three business days to fully complete your request for a SAN certificate. Using a shared Rackspace SAN certificate carries an additional monthly fee of $36 per domain. Customers who use this certificate type for secure delivery are charged the standard per-GB fee for CDN bandwidth plus the HTTPS request fee ($0.010 per 10,000 requests). Customers who choose a Custom secure certificate have the most flexibility over their certificate because they fully own it. No other Rackspace customers can use or have access to this certificate. When provisioning a Custom certificate, you have the option for a SAN, wildcard, or standard certificate. 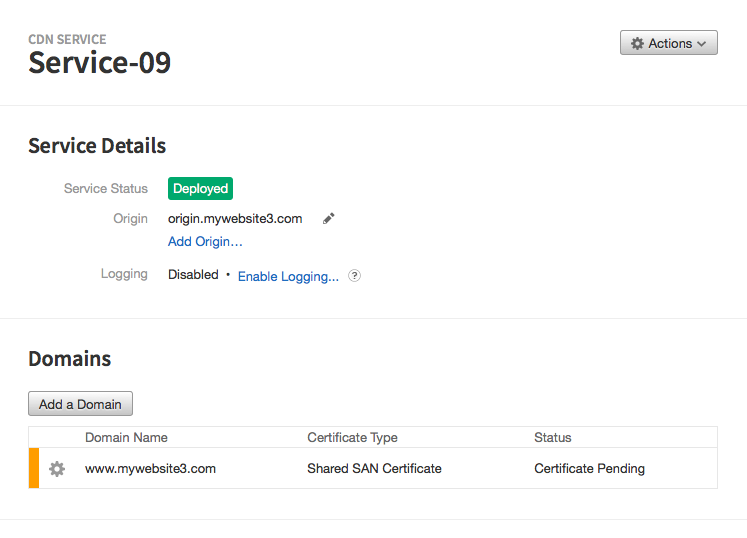 A custom SAN certificate enables you to put multiple domains on a single certificate. Customers often use this option if they want to manage multiple brands under a single certificate. For example, your car cleaning business might own squeakycleancars.com, as well as cleanyourcarshere.com and best-in-business-car-cleaning.com. By using a custom SAN certificate, you can put each of these domains as alternate names on your SAN, and save the cost and time associated with provisioning a certificate for all of your domains. A wildcard certificate enables you to add multiple subdomains to a single certificate. Your primary domain might be cleancars.com. Provisioning a wildcard certificate for *cleancars.com allows you to secure anything before that domain - for example, images.cleancars.com and mobile.cleancars.com. To get a Custom certificate for your domain or domains, start by creating a CDN service with HTTPS enabled, as described in the Rackspace shared domain and SAN certificate sections. After your service is deployed, you can request a certificate by clicking the Request a Secure Certificate link in CUSTOM SECURE CERTIFICATES in the sidebar, which is shown in the following figure. This link routes you to a page to create a ticket. When you request a Custom certificate, you need to supply multiple types of information. Fill in all bolded items in the Custom section of the ticket message. After you submit the ticket, a support technician contacts you to verify your information and sends your request to a CA to be processed. Note: The CA contacts the administrator of the domain to confirm that Rackspace has the right to request a certificate on your behalf. The CA uses the domain’s WHOIS information to determine who to contact. For more information about WHOIS information, see the previous section on Organizational validation. Note: It might take up to five business days to fully complete your request for a Custom certificate. Using a Custom certificate with Rackspace CDN carries an additional monthly fee of $730 per certificate. Customers who use this certificate for secure delivery are charged the standard per-GB fee for CDN bandwidth plus the HTTPS request fee ($0.010 per 10,000 requests).